Masala Dosa Recipe is a very popular dosa recipe in all of the dosa varieties. This dosa is made by spreading a potato mixture or aloo masala as a dosa topping. This is the most preferred dosa all across south india. 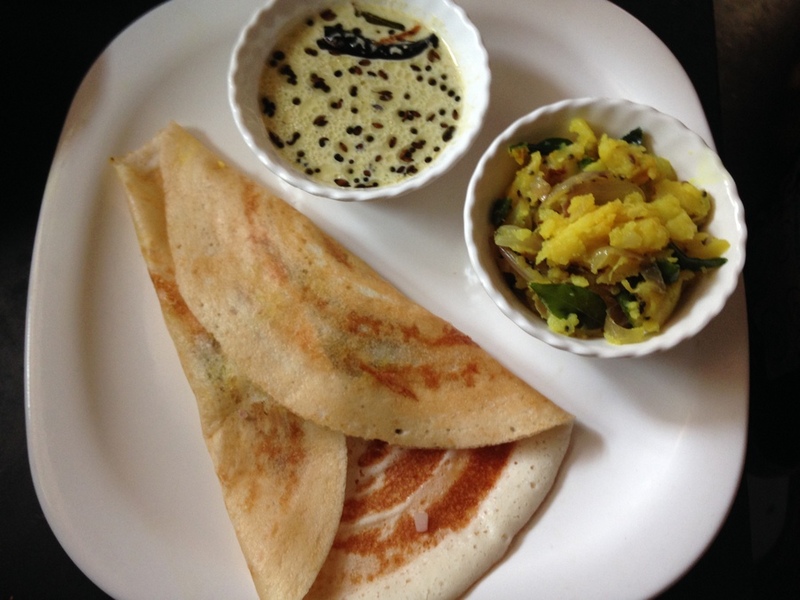 Dosa are usually in the form of pancakes and one of the common indian breakfast recipes usually made by using the batter of rice and urad dal. It does take a while to make this dosa as we need to keep the batter ready and this south indian masala dosa requires to make potato masala topping for the dosa. It is a delicious breakfast recipe and a healthy one too and is mostly eaten by south indians with sambar or chutney. The south indian masala dosa needs a lot of patience and is definitely not an instant breakfast. 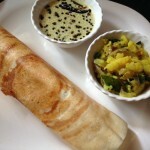 I love to try out various dosa varieties and with time would love to update different kinds of dosa recipes. The basic method of dosa making is always the same but, to it we can add different spreads as per our preference and relish its flavor. Masala dosa is called with that name as we usually add potato masala as the topping to it where the potatoes are boiled, peeled and mashed and a masala is made with flavorful tempering. To the plain dosa, if masala that is potato filling is added then it becomes masala dosa. If the batter is made perfectly then the dosa comes out very crispy and also gives an amazing golden or brown color if methi(fenugreek seeds) or chana dal is added. 1.How to make the dosa batter. 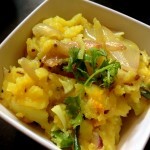 2.How to make the masala that is potato filling. 3.How to make the dosa. 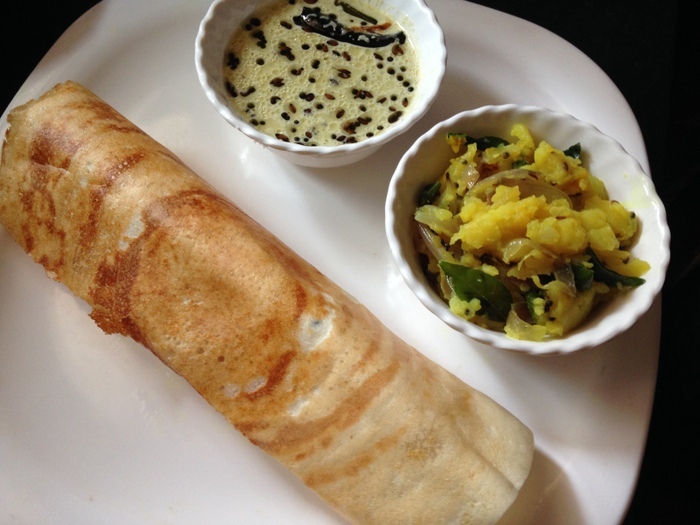 Let us go through the detailed instructions in making a traditional masala dosa recipe. A very popular masala dosa recipe from south india which is made by using dosa batter and potato masala. Firstly, wash the rice and urad daal well. To it add fenugreek seeds, chana dal, add good amount of water and soak it for about 6-7 hours. Drain out the soaked water from all the ingredients. Mix all the ingredients that is urad dal, rice, methi seeds, chana dal and cooked rice. Blend all the mixed ingredients into a fine paste/batter by adding very little water if required. Mix the whole batter well. Allow the batter to ferment overnight. Next day to the batter, add salt and mix well. Batter should not be too thick nor too thin. Firstly, boil the potatoes in water by adding salt and a pinch of turmeric powder. Peel off the potato skin and mash the boiled potatoes. In a separate pan, add oil and heat it. Add the mustard seeds, cumin seeds and allow it to splutter. Add green chillies, add curry leaves and let them crackle. Add sliced onions and saute till onions become soft. Add the mashed potatoes, mix well and cook for a minute. Lastly, add the chopped coriander leaves and keep it aside to fill in the dosa. Heat the griddle/tawa well, take an onion slice and brush it on the tawa. Take a ladle full of dosa batter and drop it at the centre and start spreading the batter in a circular way evenly and cook. Smear some oil on the surface and corners and cook for few seconds on medium flame. Add the potato masala filling at the centre, fold it and remove from the griddle. Serve it with chutney or sambar. 1.Methi seeds are usually added to give a crispy texture to the dosa and also a golden brown color. 2.Chana dal/bengal gram too is added to give color and taste to the dosa.